Agriculture and agricultural science students at Waterford Institute of Technology (WIT) learned that they have a broad choice of career options open to them at a careers event yesterday (20 November) which was attended by representatives of the agri-business and banking industries. Over the past few years, agriculture courses in WIT have risen in popularity in keeping with the overall national trend. WIT offers two courses in Agriculture, a three year level 7 BSc in Agriculture (WD126) and a four year level 8 BSc in Agricultural Science (WD191). Dr Woodcock went on to express his sincere appreciation to the speakers who gave of their time so generously and gave the 3rd year and 4th year Agriculture and Agricultural Science students much to consider. 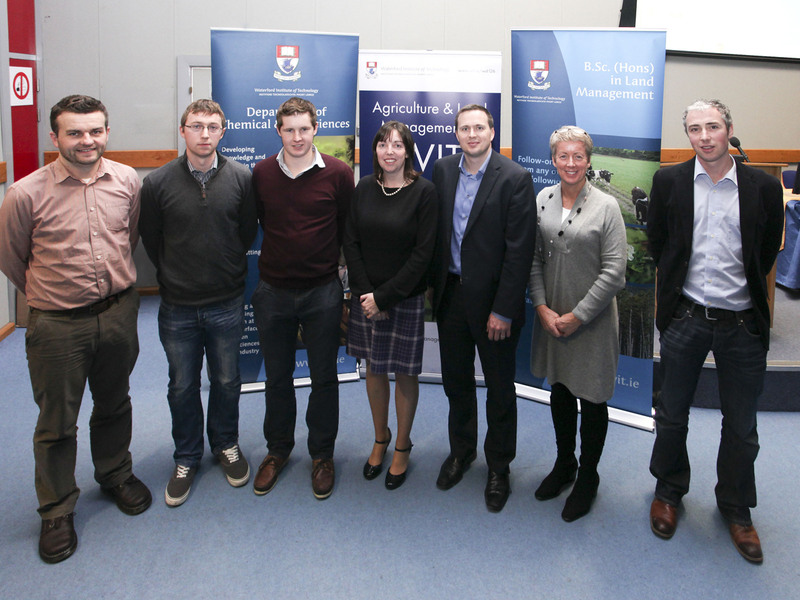 The four industry speakers who contributed to a very informative day were Rob O'Keeffe, Marketing Manager for Glanbia, working specifically in the Gain Feeds / Agribusiness section; Dr Anne Marie Butler, Agri-Business Development Manager, Ulster Bank; James Cunningham, Glanbia Agribusiness and Eanna Galvin, Dawn Meats. Rob O'Keeffe is a WIT marketing graduate whose career goal at the outset was to work with Glanbia. He explained to the students how he was inspired by Liam Griffin to set himself short-term goals which would help him to achieve his ultimate long-term objectives, and by doing this he managed to land his dream job. Key to Rob's talk was the message that, while graduate programmes are fantastic routes to employment, there are other career paths which can be just as effective and rewarding. Anne Marie Butler studied Agriculture in UCD before completing her PhD as a Teagasc Walsh Fellow. Anne Marie was perfectly positioned to discuss the role her education had played in helping her along her career path, and outlined many practical tips which she has picked up working on the ground with farmers for Ulster Bank. James Cunningham graduated with a level 7 degree in Agricultural Science in WIT before completing his level 8 degree in UCD. Having finished his formal studies, James was offered three different graduate programmes and as such, was the ideal person to explain to students some of the practical things he did to put himself in such a position. Having chosen the Glanbia programme, James outlined what his day to day work involved, how he is evolving through his current role, how 100% is expected of him on a daily basis and how he felt his key selling point in interviews was the consistency he has shown throughout his academic and non-academic life. Eanna Galvin studied Agricultural Science before completing a level 8 degree in Food Science and Innovation, both in WIT. For Eanna, the mixture of these two qualifications meant that in interviews he was able to discuss food production in detail right throughout the food chain, from primary production to the point where the product appears on the supermarket shelf. Eanna is currently on the Dawn graduate programme, he is leading two large projects on the Dawn Grannagh plant, and has recently spent six months working in the UK. Angela Collins of the WIT careers office gave a presentation on CVs and interview skills, and stressed that her office door was always open to students who required help with these or related issues. For more information on courses in the land sciences, visit www.wit.ie/courses. To apply for these courses, visit the CAO on www.cao.ie.